Sohoyini is enthusiastic about youth's exposure to arts and world cultures. 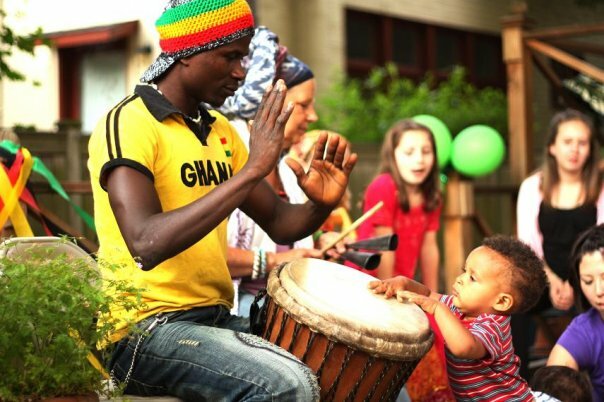 Our unique programs foster confidence, creativity, rhythm, and coordination while creating cultural awareness. Sohoyini encourages team work and community as well as promoting individual kinesthetic and spacial awareness, hand-eye coordination, and physical strength. These engaging educational programs are available as age-appropriate experiences for groups from the preschool to University level. If you have something in mind that does not fit neatly into one of these categories, let us know- we would love to create a unique learning environment with you! Residencies offer a unique opportunity for an in-depth learning and cultural experience. Each session offers students a chance to actively participate in the dance and music of Africa. Sohoyini creates inviting learning environments and nurtures creativity while encouraging multicultural understanding. We work together with the coordinating organizers to fit our program to your curriculum and materials. Components of your program can include dancing, drumming, singing, instrument or costume making. After learning entire choreographies, participants present a culminating performance for the school and/or friends and families. Expose your school or group to the exciting traditions of West Africa with one of our colorful, energetic performances. Bright costumes, bold choreography, and ancient traditions are showcased in an educational setting sure to excite students about the cultures of Africa. A typical show is 45-55 minutes long, and includes performances of dance, music, and song. We also share a bit about the history, meanings of the costumes and instruments, and cultural setting in Africa. Arrangements can be made for longer or shorter presentations, and we are happy to organize two consecutive assemblies for larger schools. Students enjoy a onetime journey into the world of African art. Sohoyini's workshops are similar in content to our residencies, but condensed into a shorter time, offer a perfect taste of Africa sure to spark interest and creativity. Take your pick of a focus on rhythm, movement, instruments, singing, costumes, or something else.